If you saw my post on "low-fat" Cream Cheese Brownies, you might remember that I was inspired to make the brownies after reading a Chocolate Chip Cookie recipe that was given to me by Dolores, the wife of Eprof2. You may also remember that I vowed to change the reputation of the Prune by calling them Dried Plums from that point forward. So if you are reading this Dolores, I hope you don't mind that I changed the name of the recipe. It's for the best. Dried plum puree: Combine 2/3 cup of dried plums (about 12 pieces) with 3 tablespoons hot water in a food processor. Pulse on and off until dried plums are finely chopped and mixture is smooth. Makes about 1/2 cup. Preheat oven to 375. Coat baking sheets with vegetable cooking spray; set aside. In a large bowl beat dried plum puree, butter sugars, eggs and vanilla to blend thoroughly. In small bowl mix flour, baking soda, and salt. Stir dry ingredients into dried plum mixture; mix completely. Stir in chololate pieces. Drop tablespoons (I used a cookie scoop which is larger) onto prepared baking sheets; flatten slightly. Bake about ten minutes (I did some at 9 minutes and they were soft and chewy) until lightly browned around the edges. Remove to racks to cool completely. Makes about 48 cookies. The texture of these cookies are not like traditional chocolate chip cookies. They do not get crisp if you bake them longer, only dry on the inside. They are not as cakey as cookies made with applesauce, but more of a soft and chewy texture. I loved them and plan on making them again and again. I froze a bunch of them because I could'nt keep them around me or I would have eaten them all! My favorite cookie is my sisters Oatmeal cookies and I think she posted the recipe over on PBE. Is the recipe for the Yummy Date Bars (Jan 30th '06)posted somewhere? If not can I get it from you? They sound delish! Annie, yes, Dolores and I read your post today (Sunday) and we're so glad that you liked them so very much. 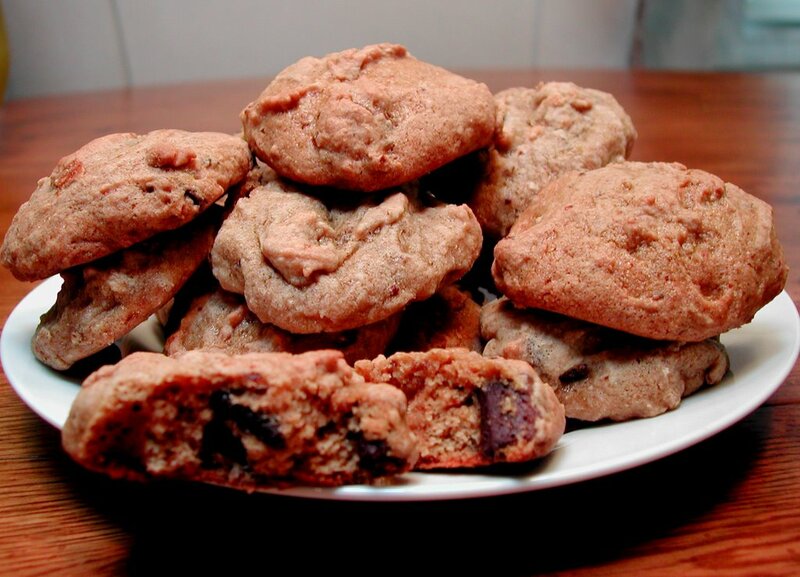 Welcome to the club of "dried plum" chocolate chip galletas (cookies). The changes you made will be tried in our next batch. Dolores tells me that an option is the mini-chocolate chips as well as chunks. As a matter of coincidence, Dolores is in the kitchen as I write this to you preparing the Italian Prune Bars filling to bake tomorrow or the next day. Have a great week. We'll be checking back again. Love your blog. I love, love, love chocolate chip cookies, and these sound really good as well. If I tried them I couldn't tell my family that I used the dried plum puree, not until they tasted them and decided to they like the cookie. Doodles, I love Oatmeal cookies too; especially choc. chip and Oatmeal raisin.Yum!! Kim, I will have to look for that recipe and I will post it soon. Stay tuned!! Jen, I just saw that commercial today, sounds interesting! Ken, I'm glad you reminded me of that blog, I had forgotten about it. Kim is asking for the same recipe and I will post it soon for you both. Thanks for visiting. Eprof2, I really did love the cookies!!! So glad you are trying the Italian Prune(Dried Plum)Cookies, let me know how they turn out. Lue, I think you would love these cookies; and I think it is a good idea to wait on telling anyone about our "secret ingredient" until they've tried them. Always glad to hear from you. I can't believe I inspire YOU. You're great!! Thanks for popping in. THat's a REALLY hard question. I honestly prefer cookies without chocolate, so my favorite would probably be...hmmm...cinnamon pecan, ice box nut, or peanut butter. HOWEVER, if the question is what kind of chocolate chip cookie is your favorite, I have a recipe that will be posted soon that is the BEST is the whole world! I also love oatmeal cookies. If it sounds like all I do is eat cookies, it's not. Really, I usually make them, have ONE, and give the rest away! Claire, I can't wait to see THE BEST choc.chip recipe. You sure DO make a lot of cookies. You're lucky you can control yourself and only eat one. I also eat one...One after another! !